Why should an entrepreneur make use of Digital Marketing? In view of our mission to help our incubated start-ups geared up with the best practices, tools and advice from experts, Turbine held a workshop on the Introduction to Digital Marketing. We were honored to have Noor Sheriff, the Digital Marketing Executive of ENL Property, as our guest speaker, accompanied by Bénédicte de Comarmond, the Communication Manager of ENL Property. Digital Marketing is a very vast field which is constantly updating. 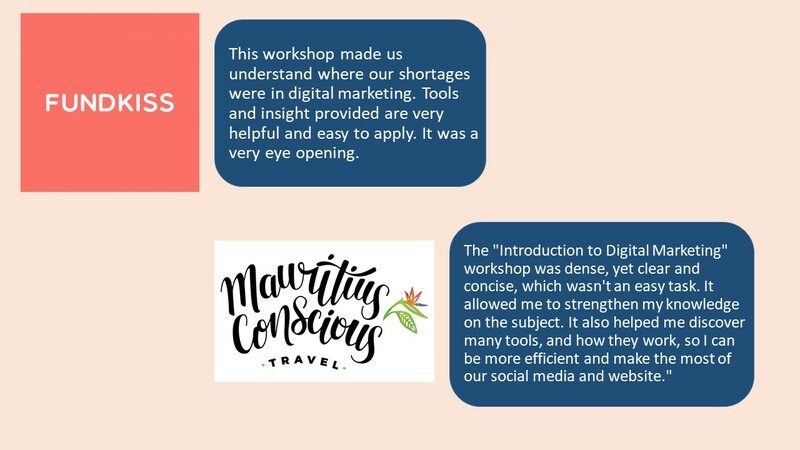 This term frightens many, however, after this workshop, the objectives and context of Digital Marketing was not only clear and easy to understand but also fun! Noor broke down the components of Digital Marketing step by step, sharing with us insights from Digital Marketing Gurus and free tools that we can use to enhance our online marketing. Entrepreneurs are guaranteed to be happy with all the learning we got through this workshop. Ever thought whether having a website will be a good means to connect with your stakeholders? Wondering if it actually works and how? There are a few components in digital Marketing that actually can help you track the performance of your website, identify the active pages on your website, your audience and many more. One of the tools that permit you to track and understand what is going on your website is Google Analytics. According to Noor Sheriff “Google Analytics is the first must-have on your website. It is Google’s free analytics tool to measure data from all your website traffic to give you insights.” Google analytics helps you understand your online audience and how your marketing strategies are performing. He explained the various components of Google Analytics, referring to the terms being used and how to best use its features. Noor Sheriff also explained the concept of Search Engine Optimization (SEO) and Search Engine Marketing (SEM). SEO allows the website to rank top on google search based on various keywords used on various pages of the website. He introduced a few effective free tools such as Yoast SEO and demonstrated how it really enhance the website. Noor used a few tools to vet the website of our incubated start-ups, giving them real and concrete advice accordingly. He further explained how SEM can be used for adverts. SEM is actually one of the most effective ways to grow your business in an increasingly competitive marketplace. Noor made our incubated start-ups get acquainted to the different ways of conversions using the digital marketing. Inbound Marketing which involves content and context forces one to be client centric. Nowadays, in order to compete, a business need to be different and provide as per clients’ demand. As per Noor, inbound marketing is focused on attracting customers through relevant and helpful content and adding value at every stage in a customer’s buying journey, empowering the customer. To be honest, this workshop went on for more than 3 hours without any break, it was that intense and fun. The above mentioned topics were not the only ones that we covered, there were also Google Adwords, CRM etc. Noor not only tackled each question of the start-ups but also gave a lot of tools, insights and advice. Each person who attended this workshop is sure to have grasp the context and we can see that our start-ups have already started to work accordingly. Seeing the importance, intensity and quality of this workshop, Turbine wishes to extend it to other entrepreneurs and digital marketing intrigues in Mauritius. Let us know if you wish to attend the workshop. Drop us an email on hello@turbine.mu with reference to Insightful introduction to Digital Marketing workshop. Passionate about the start-up world and having a strong marketing professional background with a Bachelor's degree focused in Management minor Entrepreneurship from University of Mauritius. https://turbine.mu/wp-content/uploads/2018/07/noor-sheriff.jpg 780 1560 Pooja Raghoo /wp-content/uploads/2018/10/logo-turbine-50.png Pooja Raghoo2018-07-25 09:30:272019-04-08 16:43:58Why should an entrepreneur make use of Digital Marketing? At what time of the day are we the most efficient? How are incubators changing the start-up scenes around the world?